At twenty five past midnight on 8th August an R.A.F. Wellington Mk. XIII bomber of 69 Squadron left its base at Northolt heading for Normandy in France. The Invasion, begun on 6th June was well under way with the Allied forces closing in on the German army soon to be squeezed into the so-called Falaise Pocket. One of the crew of four, the pilot, was Squadron Leader Kenneth George John Wakefield service number 40035. He was aged 29 years and came from the BRIGHTON area. The others were F/O J.B.T-H.Bigland, Navigator of Sussex aged 34, P/O K.F.Rawlinson Air Bomber of Richmond Surrey aged 24, and F/O J.F.A.Neal Tail Gunner aged 24, from Leicestershire. They were operating in darkness with 34 Wing of the 2nd Tactical Air Force in support of the British and Canadian Armies and their unarmed mission was one of photo-reconnaissance using the flares that they dropped to take pictures of enemy positions and troop movements. Unfortunately this low, hazardous, flying technique put a slow flying aircraft like a Wellington into an exposed position where search lights and German 'ack-ack' using tracer bullets, could bring them down. This was the fatal outcome for their Wellington on photo and visual reconnaissance of the town of Conde-sur-Noireau and it went on to crash in flames 18 kilometres South East near the small village of Breel. The Normandy Association of Air Remembrance http://ansa.ornemaine.free.fr wishes to commemorate the event next year with a church service, a parade and an unveiling of a new memorial in the village and also to make welcome any known relatives or friends of the deceased airmen. Kenneth George John Wakefield was the son of Alfred Thomas and Mary Gertrude Wakefield; husband of Margaret Joyce Yrene Wakefield, of BRIGHTON, Sussex. My task is to find any members of the families alive today who may wish to attend. This page was added on 10/08/2007. Are you the Ron Vickers who was in RAF Kirkham Armament School with me, SAC 2440188? About 3 yrs ago, i stayed in a cottage in the village of Breel and my wife and I had a stroll around the small church and its grounds and we came across the grave of these airman. I seem to remember that one of them was not in the grave, only 3, but I may be mistaken. The local children tend to the grave and treat it as if it was one of there own, which made me feel very grateful towards the french people. I did not know that the pilot was from Brighton, as I am. Its a small world. On the 8th August 2008, a ceremony was held in the village of Breel and some 30 English friends and relatives of the four airmen attended. Unfortunately I wasn't able to find any relatives for Squadron Leader Wakefield as there were no descendants. I did manage to contact some very distant cousins in Hawaii but although they were keenly interested they were unable to come to Europe. We were however delighted to welcome the last surviving pilot officer of 69 squadron, Stan Hayward, who made a great impression and was truly wonderful. 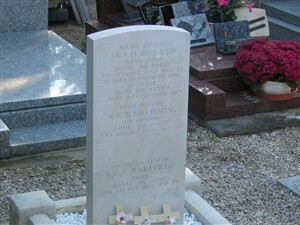 He remembered Kenneth Wakefield from when they both served together at Northolt. F/O Neal's family were part of the event because, "Allen" Neal had actually landed near Breel before the crash on that day, but unfortunately died later on a similar mission near Germany. He was of course not buried with the rest of the crew in Breel churchyard but his name appears with the others on the new remembrance stone on the village green. My effort to find a link with Brighton came to nothing and I concluded that as he was married, then he was probably in temporary accommodation, likely billeted in one of the large hotels. Any suggestions welcome. His family and that of his wife, Margaret (nee Fenwick) would seem to have had no connections with the town. If you have any background on Wakefield I would be most pleased to receive it. Just a note about Kenneth Wakefield. His father had died in April 1915 in Hawaii and his mother who was 8 months pregnant with Kenneth boarded the Lusitania and was rescued from the water. Tragic family.